In publishing its full-year results statement for 2012/13 today, SSE not only reviews the past year, but details its future offshore wind plans. Amid a turbulent economic environment, the company says its "balanced approach to business" – generating electricity from a wide range of sources including gas, coal and renewables – positions it well for the way ahead. SSE outlines five long-term priorities in its annual statement, including a commitment to "flexible and ‘greener’ electricity production". The company says it wants to increase its "capability in the operation and maintenance of its assets, especially on- and offshore wind". Having restated its strategic objective of delivering a 50% cut in the carbon intensity of its electricity, SSE says that it remains on track to achieve this goal by 2020. The utility's portfolio will shift from a prevalence of gas and coal towards gas and renewables by that date. This will involve "the commissioning and development of additional renewable-energy capacity". At the end of March 2013, SSE owned, or had an ownership interest in, over 13GW of generating capacity, 3.24GW of which was renewable - including hydro, pumped storage, onshore wind, offshore wind and dedicated biomass. Based on contracted output from renewable-energy sources, SSE's UK generation plant delivered 6.3TWh in the year to 31 March 2013. Its operational renewable capacity in the UK was 2,777MW, including its share of joint ventures. Of this, 898MW was onshore wind and 349MW was offshore wind. The latter had an electricity output, in the year to March 2013, of 1,066GWh. The company confirmed its belief that the "inherent risks [of offshore wind] are best managed through partnership arrangements". Accordingly, SSE has ownership interests in; 504MW Greater Gabbard, through Greater Gabbard Offshore Winds Limited, with a 50% stake; 367MW Walney 1&2, through Walney (UK) Offshore Windfarms Ltd, in which it has a 25.1% stake; and Beatrice, the demonstration project off north-east Scotland, in which SSE has a 5MW stake. SSE's next offshore wind project is the up to 504MW Galloper development. 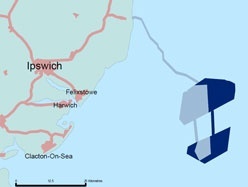 Located close to Greater Gabbard in the North Sea, it would be a 50:50 partnership with RWE npower Renewables. A final decision on planning consent is expected shortly from the Secretary of State for Energy and Climate Change. Assuming consent is received, SSE expects to make a final investment decision in the first half of 2014. Meanwhile, the planning proposal for the 1,000MW Beatrice project in the Moray Firth – a 75:25 partnership with Repsol Nuevas Energias UK – is currently with Marine Scotland, with a decision expected in late 2013. Consent for the project's onshore grid connection was received from Moray Council in February 2013. Over the next financial year, SSE says its investment priorities are to secure consent for these two projects and introduce "new and potentially diverse sources of funding into the offshore portfolio". Looking further ahead, SSE is also involved in two consortia that could deliver several gigawatts of further capacity beyond 2020. SeaGreen, a 50:50 partnership between SSE Renewables and Fluor Limited, is looking at the three-phase development of the 3.5GW Firth of Forth zone. And Forewind – a four-way partnership between SSE, RWE npower Renewables, Statoil and Statkraft – is developing the 9GW Dogger Bank Round 3 Zone. SSE says that decisions "regarding the extent of the build out of this pipeline will be based on its disciplined approach, consistent with its financial principles and focused on taking forward only the best investments and achieving the strongest possible returns to support dividend growth." SSE says that it "welcomes the clear policy support for increased renewable penetration in the portfolio mix… delivered through the financial support of the Renewables Obligation". Looking ahead, an effective carbon price and a cheaper supply chain for renewables are essential to growth in this sector, it adds. A key priority for SSE in 2013/14 is to secure a package of electricity market reforms by working with the UK Department of Energy and Climate Change (DECC). But it also calls for "appropriate longer-term policy support delivered beyond electricity market reform" and says that the viability of the renewables industry remains dependent on this. More widely, SSE says that it is providing "practical leadership" in the drive towards lowering the levelised cost of energy from offshore wind to £100/MWh by 2020 and is "focused on forming strategic alliances and investments" accordingly. Among them is the development of the UK’s national offshore wind testing facility at Hunterston in North Ayrshire. In partnership with Scottish Enterprise, Mitsubishi and Siemens, up to three prototype offshore turbines will be tested over a five-year period. Construction at Hunterston began in March 2013 and the facility is expected to be fully operational by the end of 2013.